BANGKOK--(BUSINESS WIRE)-- Park Hyatt Bangkok opened its doors today, marking the first Park Hyatt hotel in Thailand. The hotel is centrally located in the heart of the Thai capital’s central business district. Park Hyatt Bangkok features contemporary architecture matched by luxurious residential interiors, expertly curated art, world-class food and wine, and refined service, all coupled with a promise to offer uniquely Thai experiences that reflect the country’s rich culture, gracious hospitality, and colorful lifestyles. Once the scene of elegant garden parties hosted by the British Ambassador to the Kingdom of Thailand, the prime corner plot in the heart of Bangkok is now home to the newest Park Hyatt hotel. The interior design brief – to create a sophisticated private residence and sanctuary reflecting Thailand’s rich culture – was eloquently executed by New York-based Yabu Pushelberg, who also served as the designers of the brand’s flagship Park Hyatt New York hotel. This is the award-winning design duo’s first hotel in Bangkok, and they have created a calm and stylish environment unfolding through a series of unique and intimate spaces. New York-based AvroKO designed the three uppermost floors of the hotel’s Penthouse Grill & Bar. “We found the perfect interior for Park Hyatt Bangkok is when all the parts – the lighting, materials, space, texture – work as a whole and you get this sense of calmness, of sensuality,” said designer and co-founder Glenn Pushelberg. 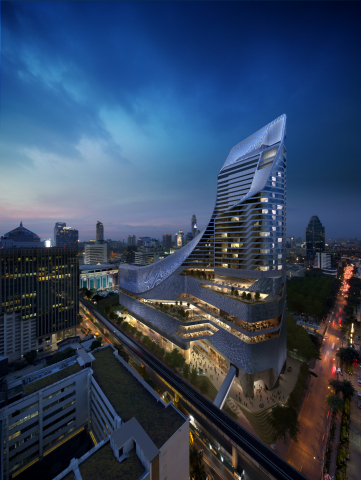 Park Hyatt Bangkok’s architecture is designed by AL_A, the London-based studio founded by Amanda Levete and Bangkok-based Pi Design (consultant architect of record). The hotel and an adjacent luxury shopping mall are bound together by a continual looped form merging plinth and tower. The twisted coil forms a three-dimensional figure of eight, a lucky number in Chinese culture. Drawing on motifs and patterns found in traditional Thai architecture, the eye-catching façade is clad in extruded aluminium tiles, creating a shimmering moiré-like pattern. The design comes together with spectacular views of the bustling, energetic city from numerous outdoor terraces. Similar to other Park Hyatt hotels, art is intrinsic to the experience. Two of Park Hyatt Bangkok’s most dramatic installations were created by Japanese artist Hirotoshi Sawada. ‘Pagoda Mirage’ incorporates hundreds of small, conical copper swirls, suspended en masse to evoke the reflection of a pagoda on water. Equally striking is the ‘Naga’ (Level 9), a series of batons suspended from the ceiling that resembles a mythical water dragon traveling between the pool and internal waterfall. As the first Park Hyatt hotel in Thailand, the hotel created industry buzz well before its opening, earning the ‘Most Anticipated Hotel Opening’ title in this year’s Travel Top 50 annual survey conducted by influential design and culture magazine Monocle. For more information on Park Hyatt Bangkok or to make a reservation, please click here. Park Hyatt hotels provide discerning, affluent business and leisure guests with elegant and luxurious accommodations. Guests of Park Hyatt hotels receive highly attentive personal service in an intimate environment. Located in several of the world's premier destinations, each Park Hyatt hotel is custom designed to combine sophistication with a distinctive regional character. Park Hyatt hotels feature well-appointed guestrooms, meeting and special event spaces for groups, critically acclaimed art, food and beverage program, and signature restaurants featuring award-winning chefs. There are currently 40 Park Hyatt hotels in the following locations: Abu Dhabi, Bangkok, Beaver Creek, Beijing, Buenos Aires, Busan, Canberra, Changbaishan, Carlsbad, Chennai, Chicago, Dubai, Goa, Guangzhou, Hamburg, Hangzhou, Hyderabad, Istanbul, Jeddah, Maldives, Mallorca, Melbourne, Mendoza, Milan, Moscow, New York, Ningbo, Paris, Saigon, Sanya, Seoul, Shanghai, Siem Reap, Sydney, Tokyo, Toronto, Vienna, Washington, D.C., Zanzibar and Zurich. For more information, please visit parkhyatt.com. Hyatt Hotels Corporation, headquartered in Chicago, is a leading global hospitality company with a portfolio of 13 premier brands. As of March 31, 2017 the Company's portfolio included 708 properties in 56 countries. The Company's purpose to care for people so they can be their best informs its business decisions and growth strategy and is intended to create value for shareholders, build relationships with guests and attract the best colleagues in the industry. The Company's subsidiaries develop, own, operate, manage, franchise, license or provide services to hotels, resorts, branded residences and vacation ownership properties, including under the Park Hyatt®, Miraval®, Grand Hyatt®, Hyatt Regency®, Hyatt®, Andaz®, Hyatt Centric®, The Unbound Collection by Hyatt™, Hyatt Place®, Hyatt House®, Hyatt Ziva™, Hyatt Zilara™ and Hyatt Residence Club® brand names and have locations on six continents. For more information, please visit hyatt.com.